The latest communications networks demand specific performance criteria from their core timing and synchronisation devices, usually a Voltage Controlled Temperature Compensated Crystal Oscillator (VCTCXO). IQD’s new ‘best‐in‐class’ low jitter, tight stability IQXT-316 series VCTCXO is designed to satisfy these key standards through optimisation of the critical performance areas. For example, the new model utilises proprietary ASIC technology to meet the tight short and medium term stability requirements (±50ppb to ±250ppb depending on the operating temperature range) required for packet network synchronisation for small cells. This combined with its outstanding slope performance as low as ±20ppb/degrees and low power consumption makes the IQXT-316 the ideal choice for small cell synchronisation requirements. To meet network interface requirements such as 10GE etc, the IQXT-316 series delivers RMS phase jitter down to 280fs over 12kHz to 5MHz and low phase noise of -157dBc/Hz @100kHz to meet the radio interface requirements of LTE-A (TS36.104) and WCDMA (TS25.104) transceivers. This enables a single device to be used for both functions. The new model also offers excellent short term ageing of ±20ppb max per day and long term ageing of ±3ppm max over 10 years. The VCTCXO option includes a patented varactor linearisation circuit which removes the effects of tilt and the oscillator can be pulled between ±5ppm to ±12ppm with a control voltage of 1.5V ±1V and an input impedance of 100k Ohms minimum. 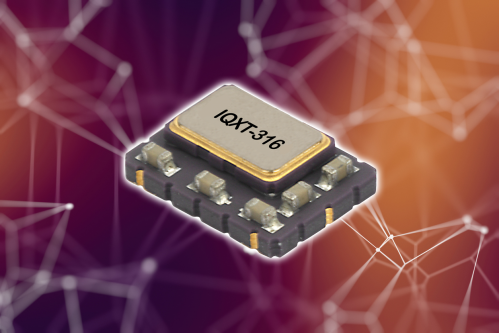 Housed in a 7 x 5mm 6-pad package, the IQXT-316 series operates over a temperature range of -40 to +85 degrees and is available with an output of HCMOS, 15pF load or clipped sinewave into 10k Ohms load and with a current draw down to 2mA and standard supply voltages of 2.8, 3.0 and 3.3V. Seven frequencies have been developed: 19.2MHz, 24.576MHz, 25.0MHz, 26.0MHz, 30.72MHz, 38.4MHz and 40.0MHz, all standard within small cell synchronisation applications and a range have been approved with a number of chipset manufacturers. Further details are available on IQD’s website at www.iqdfrequencyproducts.com or for further advice, speak to a member of our Applications Support Team.